Q. 1. Which knowledge bestows perfection? Q. 2. How was the universe created? Q.3. How does the universe change and dissolve? Q.4. Who determines the universe? 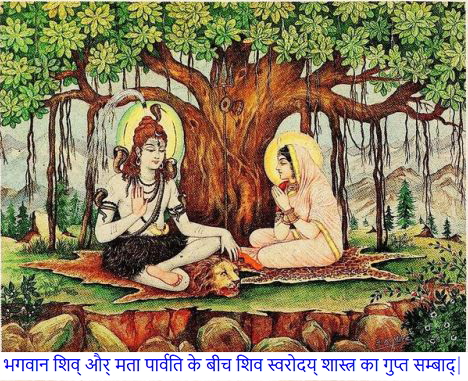 Lord Shiva responds: Creation takes place due to tattwas (subtle essences), is sustained by them and finally dissolves into them. Tattwas are the origin of the universe. There is one birthless, formless supreme existence from which evolves akasha (ether), from which comes vayu (air). From vayu originates tejas (fire), from tejas apas (water) and from apas prithvi (earth). These five elements are spread throughout the world. Creation is formed and sustained from them and again merges back into them as the subtle process of creation continues ceaselessly. Among subjects that the texts on Swara discuss are the placement, location and function of the nadis, Yoga sadhana, description of auspicious/ inauspicious nadis according to the day, rules of the five tattwas, Zodiac signs according to the day and night, the appropriate direction of travel, reverse situations, fulfilment of desires, auspicious acts during the flow of ida nadi, successful acts during the flow of Pingala nadi, characteristics of sushumna nadi, eight-fold division of elements or breath, predictions and divination, places of the five elements in the body, how to get gain and prosperity, prediction and indicators of death, attainment of psychic powers through the knowledge of swara, getting a divine child, super-psychic Astrology and Vastu connected with nadis and chakras and overcoming illnesses.